Located just outside Cincinnati, Ohio, the Mariemont School Foundation is a non-profit organization of parents, residents and alumni working to sustain excellence within the award-winning Mariemont School District. In 2012, the foundation set out to create an outdoor structure that would recognize the district’s generous supporters, display the faces of local students and faculty, and inspire others in the community to give. Charged with creating a unique, eye-catching display, able to make an emotional connection with passersby was Cincinnati design firm White Design Studio. The installation that White Design Studio created transcends typical signage to become a true work of art. Interlocking hexagonal tiles - inspired by Mariemont schools' hexagonal architecture - fit puzzle-like on a large outdoor wall in hues of brown, yellow and blue. 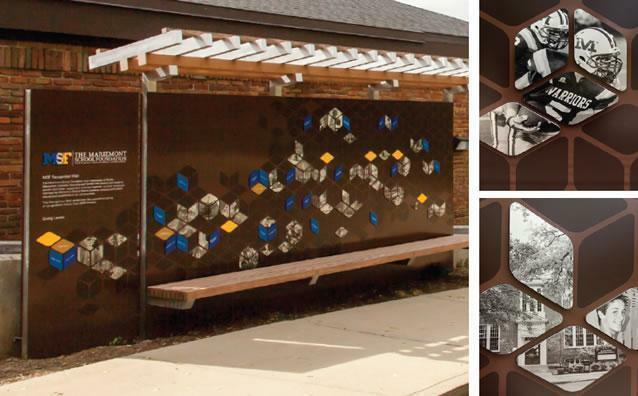 The wall is trimmed above by a metallic trellis and sited prominently at a bustling Mariemont bus stop. "The panels needed to be permanent, durable and crisp." Each tile commemorates a donor or displays a photograph of students. To create photo tiles with sharp black graphics and superior durability, White Design Studio turned to Metalphoto of Cincinnati. "The panels needed to be permanent, durable and crisp," says Thomas Dangerfield, a designer for White Design Studio. "MPC gave us great-looking photos in a very durable product." MPC's Metalphoto anodized aluminum is the only material that could give White Design Studio the photo resolution they wanted with the durability they needed for this project. Sealed under Metalphoto's sapphire-hard anodic layer, these tiles will maintain their original appearance for more than 20 years, even under exposure to extreme heat, humidity, UV, abrasion and more. In fact, the National Association of Graphic and Product Identification Manufacturers (GPI) Industry Standards and Practices Manual identifies Metalphoto photosensitive anodized aluminum as the most durable printed aluminum substrate available, citing its applicability for extreme environmental conditions and outdoor exposure. Given its location on a busy city street, the donor recognition wall also benefits from another Metalphoto characteristic - it is inherently graffiti resistant. To achieve the puzzle-like pattern, White Design Studio needed every tile to meet exacting measurements. Each tile is 5" x 3" and lines up precisely with a matching hexagonal grid on the wall. "MPC produced the images and cut them to the exact shape we needed," says Dangerfield. "Every time we have to get involved in the production process it costs our client money. Metalphoto of Cincinnati was able to produce exactly what we asked for." "This application was unique because it was outdoor. That made MPC and Metalphoto the ideal choice for this application." Additionally, Metalphoto's high-contrast blackon-silver graphics capability also helped White Design Studio create true photographic images with no compromise in resolution. "This application was unique because it was outdoor. That made MPC and Metalphoto the ideal choice for this application," says Dangerfield. "If we did any outdoor projects again, we would absolutely use Metalphoto."